(کمتر از 1/0 درصد)، و همبستگی مثبت آشکار بین Al و V در ترکیب مگنتیت. نمودارهای نسبت (wt% Ca+Al+Mn)/(wt% Ti+V) و نسبت TiO2/V2O5 برای داده‌های ژئوشیمی تأیید می‌کنند که کانه‌زایی در این محدوده از نوع کانسارهای اسکارنی است. Investigation of geochemistry, mineral chemistry and changes in magnetite mineralization generations in the Khak Sorkh iron skarn, west of Yazd. بنی‌آدم، ف.، 1392- گزارش پایان عملیات اکتشاف معدن سنگ آهن خاک‌سرخ ندوشن، 216 ص. جوادی پور، ش.، راکی، م.، 1391- گزارش ژئوفیزیک به روش مغناطیس سنجی در معدن آهن خاک سرخ ندوشن یزد، 54 ص. زاهدی، ا. و بومری، م.، 1392 الف- سنگ نگاری و شیمی گارنت‌ها در اسکارن خوت، شمال باختر تفت، استان یزد. مجله بلورشناسی و کانی شناسی ایران، شماره 2، صص. 267 تا 276. زاهدی، ا. و بومری، م.، 1392 ب- سنگ نگاری، زمین شیمی و سنگ زایی اسکارن پناه کوه، باختر یزد، مجله بلورشناسی و کانی شناسی ایران، شماره 3، صص. 389 تا 402. شریفی، ر.، 1387- بررسی خصوصیات ژئوشیمیایی اندیس‌های فلزی در منطقه پناه کوه یزد با دیدگاه اکتشافی، پایان نامه کارشناسی ارشد زمین شناسی اقتصادی، دانشگاه شیراز، 186 ص. قلمقاش، ج.، محمدیها، ک. و قهرایی پور، م.، 1382- نقشه زمین شناسی 1:100000 کفه طاقستان، سازمان زمین شناسی و اکتشافات معدنی کشور. مغفوری، س.، حسین زاده، م.ر.، رجبی، ع. و عظیم زاده، ا.م.، 1395- تحلیل رخساره‌ای و جایگاه چینه‌ای افق‌های کانه زایی روی- سرب- باریت با میزبان کربناته – تخریبی در توالی رسوبی کرتاسه پیشین، حوضه جنوب یزد، فصلنامه علوم زمین، سال بیست و ششم، شماره 102، صص. 233 تا 246. مکی زاده، م.ع.، رهگشای، م. و دلیران، ف.، 1386- پیدایش گرونای آندراریتی در اسکارن های آهن سور، نوار افیولیتی- سورک، مجله پژوهشی علوم پایه دانشگاه اصفهان، شماره 27، صص. 157 تا 167. ملکی، س.، کلاگری، ع.ا.، سیاه چشم، ک.، علیرضایی، س.، کورفو، ف. و بنی آدم، ف.، 1395 الف- تعیین سن توده‌های گرانیتوییدی همراه با کانه‌زایی مگنتیت تیپ اسکارن، منطقه خاک سرخ، بیستمین همایش انجمن زمین شناسی ایران، دانشگاه تهران. ملکی، س.، کلاگری، ع.ا.، سیاه چشم، ک.، علیرضایی، س.، کورفو، ف. 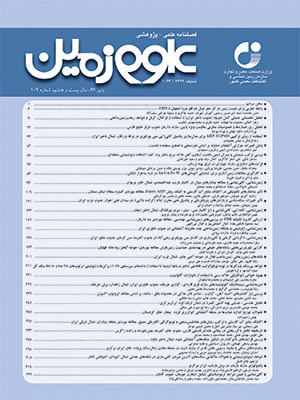 و بنی آدم، ف.، 1395 ب- کانی شناسی و مراحل تشکیل اسکارن مگنتیت دار خاک‌سرخ به کمک داده‌های مینرال شیمی. بیستمین همایش انجمن زمین شناسی ایران. Barnes, S. J. and Roeder, P. L., 2001- The range of spinel composition in terrestrial mafic and ultramafic rocks. Journal of petrology, 42:2279-2302. Dare, S., Barnes, S. J. and Beaudoin, G., 2012- Variation in trace element content of magnetite crystallized from a fractionating sulfide liquid, Sudbury, Canada: implications for provenance discrimination. Geochim Cosmochim Acta, 88: 27-50. Dupuis, C. and Beaudoin, G., 2011- Discriminant diagrams for iron oxide trace element fingerprinting of mineral deposit types. Mineralum Deposit, 46: 319-335. Einaudi, M. T., Meinert, L. D. and Newberry, R. J., 1981- Skarn deposits. Economic Geology 75th Anniversary Volume. 317-391. Hajalilou, B. and Aghazadeh, M., 2016- Geological, Alteration and Mineralization Characteristics of Ali Javad Porphyry Cu-Au Deposit, Arasbaran Zone, NW Iran. Open Journal of Geology, 6, 859-874, doi: 10.4236/ojg.2016.68066. Hassanpour, S., Alirezaei, S., Selby, D. and Sergeev, S., 2015- SHRIMP zircon U-Pb and biotite and hornblende Ar-Ar geochronology of Sungun, Haftcheshmeh, Kighal, Niaz porphyry Cu-Mo systems: evidence for an early Miocene porphyry-style mineralization in northwest Iran. International Journal of Earth Sciences, 104: 45-59. Hassanzadeh, J., 1993- Metallogenic and tectonomagmatic events in the SE sector of the Cenozoic active continental margin of central Iran (Shahr e Babak area, Kerman Province), Ph.D. thesis, Univ. of Calif., Los Angeles, 204 p.
Hu, H., Li, J. W., Lentz, D., Ren, Z., Zhao, X. F., Deng, X. D. and Hall, D., 2014- Dissolution – reprecipitation process of magnetite from the Chengchao iron deposit: insights into ore genesis and implication for in-situ chemical analysis of magnetite. Ore Geology Reviews. 57, 393-405. Huang, X.W., Gao, J. F., Qi, L., 2016- In-Situ LA-ICP-MS Trace Elements Analysis of Magnetite: The Fenghuangshan Cu-Fe-Au Deposit, Tongling, Eastern China. Ore Geology Reviews, 72: 746-759. Doi: 10.1016/j. Ore Geology Reviews. 2015.09.012. Jamali, H., Dilek, Y., Daliran, F., Yaghubpur, A. and Mehrabi, B., 2009- Metallogeny and Tectonic Evolution of the Cenozoic Ahar-Arasbaran Volcanic Belt, Northern Iran. International Geology Reviews, 52, 608-630. Kretz, R., 1983- Symbols of rock-forming minerals. Am. Mineral, 68: 277-279. Muller, B., Axelsson, M. D., Ohlander, B., 2003- Trace elements in magnetite from Kiruna, northern Sweden, as determined by LA-ICP-MS. GFF 125, 1-5. Nadoll, P., Angerer, T., Mauk, J. L., French, D. and Walshe, J., 2014- The chemistry of hydrothermal magnetic: a review. Ore Geology Reviews, 16: 1-32. Nadoll, P., Mauk, J. L., Hayes, T. S., Koenig, A. E. and Box, S. E., 2012- Geochemistry of magnetite from hydrothermal ore deposits and host rocks of the Mesoproterozoic Belt Supergroup , United States. Economic Geology, 107: 1275-1292. Rajabi, A., Canet, C., Rastad, E. and Alfonso, P., 2015- Basin evolution and stratigraphic correlation of sedimentary- exhalative Zn- Pb deposits of the Early Cambrian Zarigan-Chahmir basin, Central Iran.- Int. Ore Geol. Rev., 64, 328-353. Righter, K., Leeman, W. P. and Hervig, R. L., 2006- Partitioning of Ni, Co and V between spinel – structured oxides and silicate melts: importance of spinel composition. Chemical Geology, 227: 1-25. Shahabpour, J. and Kramers, J. D., 1987- Lead isotope data from the Sar-Cheshmeh porphyry copper deposit, Iran: Mineralium Deposita, 22: 278-281. Shafiei, B., Shahabpour, J., Haschke, M., 2008- Transition from paleogene normal calcalkaline to Neogene adakitic-like plutonism and Cu-mtallogeny in Kerman porphyry copper belt: response to Neogene crustal thickening. Journal of Sciences, Islamic Republic of Iran 19, 67-84. Stocklin, J. and Nabavi, M. H., 1973- Tectonic map of Iran, 1: 250000, Geological Survey of Iran. Zahedi, A., Boomeri, M., Nakashima, K., Mackizadeh, M. A., Ban, M. and Lentz, D. R., 2014- Geochemical characteristics, origin and evolution of ore-forming fluids from the Khut copper skarn deposit (west of Yazd, Central Iran). Resources Geology, 64: 209-232. Zarasvandi, A., Liaghat, S. and Zentilli, M. A., 2005- Geology of Darreh-Zerreshk and Ali-Abad porphyry copper deposits, Central Iran, International Geology Reviews, 47: 620-646.